Through the past couple of decades, there has been an increased emphasis on security in many different aspects of people’s everyday lives. Recently, cybersecurity has been pushed to the forefront of businesses security concerns. However, employee and public safety have become a growing issue as well. Acts of violence, terror, and theft have caused businesses in all sectors to do a double check on their security needs, looking to see if they do enough to protect their own people and assets. In many environments, the emphasis on physical security manifests itself in the form of increased number of security products or the amount of security personnel that the facility or campus has on hand. However, the way that different sectors and industry look at workplace security varies incredibly. In one of our previous blog posts, we looked at this chart below. 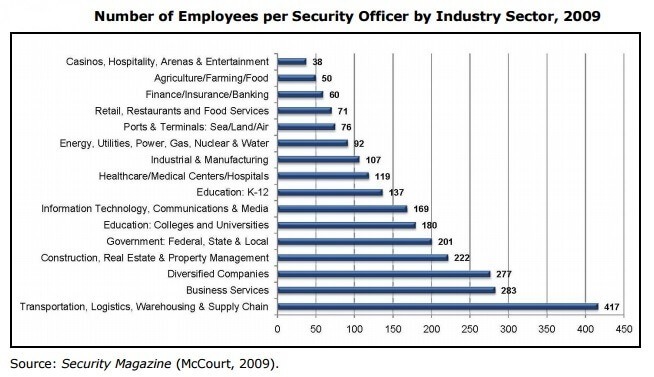 This chart shows the number of regular employees per security employee in a number of different business sectors in the United States. What we can gather from this is that the sectors that garner the highest security presence are not necessarily the ones that are protecting the most valuable assets, but ones that typically rely on public patrons coming in and out constantly. These businesses must make these customers feel safe in order to ensure they will spend time there. However, why should these other sectors not have these same standards for their employees? For instance, at the bottom of the chart, there is the “Transportation, Logistics, Warehousing & Supply Chain” sector. This sector only has 1 security worker for every 417 employees, compared to 1 to 38 in the entertainment sector. But when you compare the two industries, the things being protected are not necessarily all that different. Security for both would have the main focus on protecting people first and foremost, especially in the case of public transportation. But to add to it, warehousing and supply chain will oftentimes need to protect highly valuable goods and commodities, which can be huge targets for criminals. How Can They Catch Up? Security guard houses will instantly boost a facility’s overall security. Security guard houses act as an access control checkpoint and the main security hub for your facility. The majority of the time, the presence of a guard house alone will be enough to dissuade a potential intruder. However, the building’s main function is to control the access to the facility. The most important part of access control is being able to actively deny someone access. Facilities that only have the main gate do not necessarily have this ability due to “piggybacking” which occurs when another person slips in while a security gate is open for an authorized person. In fact, for most education campuses/ facilities use access control in some form or another as their primary form of physical security. 94.5% of primary schools, 94.9% of middle schools, and 88.8% of high schools use this type of security. Get a Guard House Quote Today! In addition to this, security guard houses work as the main security hub for your entire facility. Additional security measures like video surveillance can be headquartered here. Therefore, if you want to have a full view of the entire facility, you are going to need a lot more officers. Or through the use of security camera surveillance, the entire facility can be monitored fully from inside one of our security guard houses. Overall, the security of your facility plays a big role in the mindset of employees and their overall safety and well-being. For your business to provide the most effective security system possible, your company will need to take advantage of a number of different security techniques to provide your property with the most effective security system possible. These security guard houses will provide you with access control to your facility, a central point to monitor the entire property, and a place for your guards to organize and develop a security plan for your business. What Do You Need in a Security Guard House? Security guard houses provide a safe and calm work environment for civilian and military security guards. 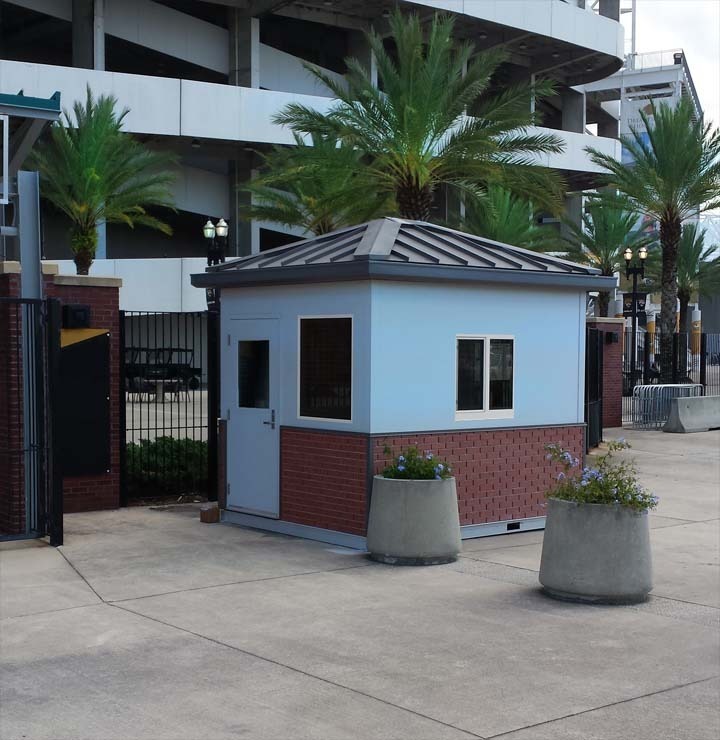 Since all of our security guard houses are custom built to customer specifications, they can easily adapt to the needs of your facility. The security guard houses can be designed to hold a singular security officer or an entire security team, depending on your facility’s safety needs. Certain industries are predisposed to a higher threat level than others. As we saw with the graph in this post, businesses like casinos, sports arenas, banks, ports, and travel terminals spend a much higher amount on security because they have a much higher threat of terrorist attack, theft of goods or robbery. In these cases, with your security officers being your first line of defense. In case of a major threat, your guard house will need to be able to withstand a large amount of force. For such these cases, we offer ballistic rated guard booths that can be built to the highest level of NIJ ballistic rated protection. If your guard house needs to be bulletproof or blast proof, our ballistic rated options will do the job for you. 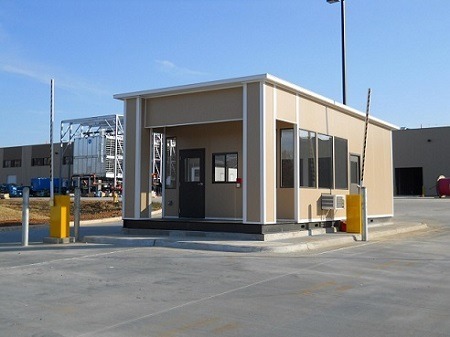 In addition to our ballistic line of security guard houses, we offer a welded steel version of our prefab buildings that provide a wide range of designed and sizes. In addition to their nearly limitless design options, they can satisfy the wind load requirements in even the harshest climates. For example, Key West Golf Club came to Panel Built, Inc. looking for a modular building that would suit these requirements. Using our welded steel line of buildings, Panel Built delivered a 6’ x 9’ guard house that had an Ultimate Wind Load Rating of 180 mph, the likes of which you would find in a category 5 hurricane. The building provides access control for the course and offers a 360-degree view of the entrance. After Florida’s treacherous 2017 hurricane season, Panel Built checked in with the club to see how our security guard house stood up against the storms. If you would like to know more about the different types of security guard houses we offer or have a question about which is right for your situation, send us an email at info@panelbuilt.com, or get in touch with one of our sales reps. We are always more than happy to help with any of your modular building needs. And, as always, we offer all of our potential customers a free quote on their modular construction projects.